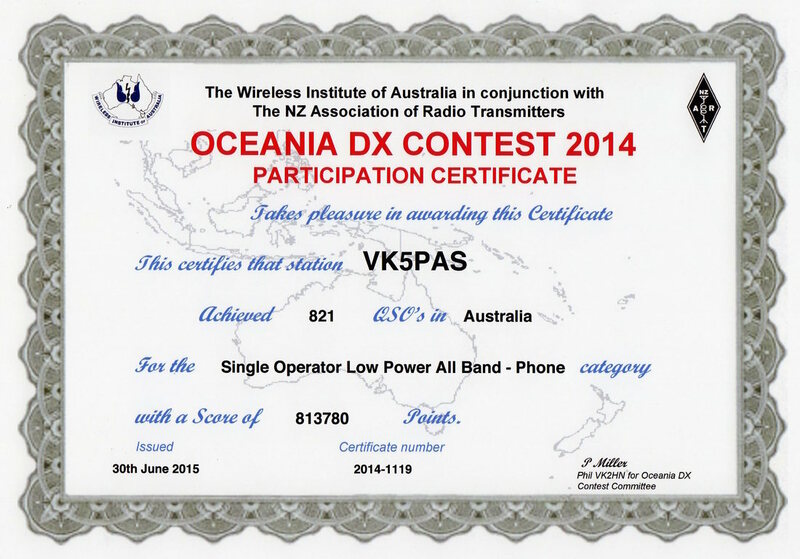 I entered into the Single Op Low power all bands category and obtained 828 QSOs and a score of 828,828 points, which got me to 3rd position in Australia in that category. And the good thing was I went to bed at 12.30 a.m. and got up the next day at 8.30 a.m. I found the 15m band into Europe, short path was excellent, as was 10m into North America. I really enjoy the 10 m band, so in 2014, I entered the SIngle Op Low power 10 Metres section. I managed a total of 327,726 points with 404 QSO's and 289 different prefixes over an 18.9 hour period. I came 1st in Australia and ﻿3rd﻿ in Oceania, and 53rd in the world. In the overlay section for Tribander, I came ﻿2nd﻿ in Australia and ﻿3rd﻿ in Oceania, and﻿11th﻿ in the world. The results for this contest came out very quickly. Congratulations to CQ magazine and the organisers. Conditions on 10m were quite good. I managed QSOs into most parts of Europe, United Kingdom, Australia, Indonesia, United States, Canada, South America, Central America, the Carribean, Japan, South East Asia, and the Middle East. 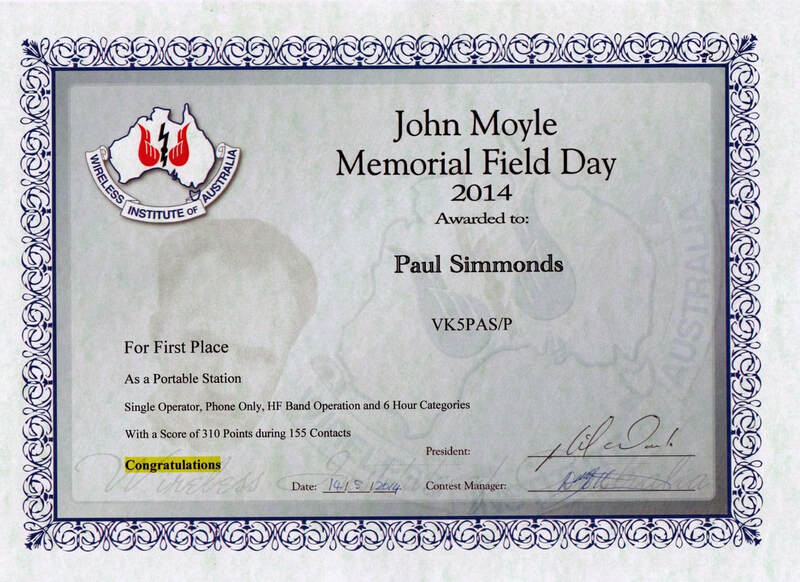 I headed to Mount Barker summit for the 2014 John Moyle Field Day and participated in the 6 hour section of the 2014 John Moyle Memorial Field Day. I ended up with 155 QSO's on 40m SSB & 20m SSB and came FIRST in this section. I had a few hours in the 2014 JIDX Contest, all on 10m and 15m. Conditions did not appear to be very good, with signals from Japan way down. Perhaps as a result of all the recent solar activity? I also had quite a few other commitments on that weekend. But I still managed 101 contacts with a score of 5,310 (11,000 points less than last year). I came second in this category to David VK4SP who had a score of 24,702 points. Don't expect a quick turn around with the JIDX. Although this is a fun contest, the organisers are very slow at turning around results. And in 2015 they lost all the records.